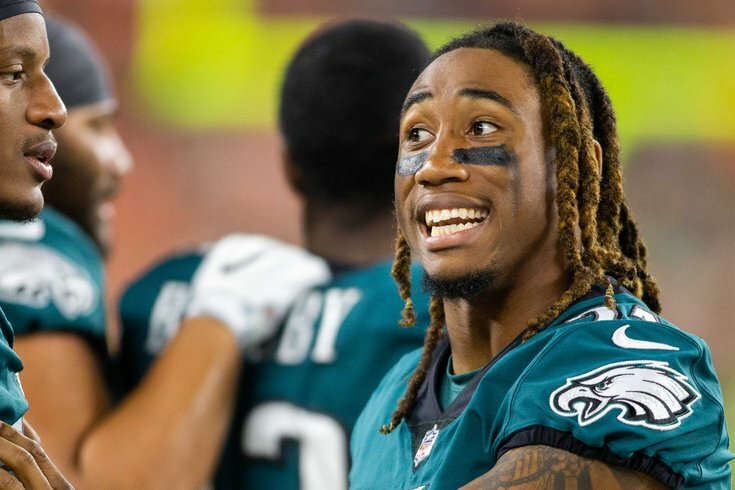 Partly because of a bad cornerback class this offseason, Ronald Darby might find some nice money on the open market. The salary cap-strapped Philadelphia Eagles are almost certainly going to lose a bunch of players in free agency this offseason, and those players may find some pretty good money in what is shaping up to be a really crappy free agent class. Here's what we predict the Eagles' free agents will find on the open market. The draft or free agency: Where are the Eagles likely to improve each position this offseason? We've been through the "should they or shouldn't they" game repeatedly with Foles and the franchise tag, and that's not what we'll do again here. However, if the Eagles don't use the franchise tag on Foles and he walks in free agency, he is going to get PAID. It won't be as good as the fully guaranteed three-year, $84 million deal Kirk Cousins got in Minnesota, because Cousins had robust competition that Foles won't have. It also likely won't be less than the idiotic two-year, $36 million deal the Broncos gave Case Keenum on the open market last offseason. #JimmyGuess: 4 years, $90 million. Will count toward the comp pick formula at the third-round pick level. Graham is still a well above average starting defensive end who consistently gets pressure on the quarterback and plays excellent run defense. He is going to find a far better market for his services than he did when he was a free agent in 2015 and the Eagles were able to get him back on a cheap deal. #JimmyGuess: 4 years, $48 million. Will count toward the comp pick formula at the third-round pick level. Darby will be an interesting player to watch in free agency this offseason. He is already clearly an NFL starter, with upside to be a really good one, as he is gifted athletically, but has yet to completely put it all together as a pro. Add in a torn ACL, and there's even more projection. Still, in a bad cornerback class this year, he is arguably one of the top three corners available, and those guys usually get paid. In a league were passing offense rules, I believe some team is going to overpay for Darby. #JimmyGuess: 3 years, $27 million. Will count toward the comp pick formula at the fourth-round pick level. When the Eagles acquired Tate, he had 44 catches for 517 yards and 3 TDs in 7 games. After the Eagles wasted a third-round pick by acquiring him at the trade deadline, Tate wasn't as productive, as he had 30 catches for 278 yards and 1 TD. To be determined if Tate's unproductive second half of the season will hurt him in free agency. Many view Tate as the best player in this year's awful wide receiver free agent class. As such, like Darby above, I expect him to be overpaid on the open market. #JimmyGuess: 4 years, $37 million. Will count toward the comp pick formula at the fourth-round pick level. Early in his career, Hicks looked like he was going to be a playmaking beast. In his first 24 career games (21 starts) in the NFL in 2015 and 2016, Hicks had 135 tackles, 2 sacks, 7 interceptions, 1 forced fumble, 4 fumble recoveries, and 14 pass breakups. Those are outstanding numbers. However, after a lackluster start to the 2017 season, Hicks tore his Achilles and was lost for the season. In 2018, playing in 12 games, Hicks had 91 tackles, 3 sacks, 1 fumble recovery, and 5 pass breakups. He did not force any fumbles or intercept any passes. • 2012 (Texas): Hip flexor, missed final 10 games. • 2013: (Texas): Ruptured Achilles, missed final 9 games. • 2015 (Eagles): Torn pectoral, missed final 8 games. • 2017 (Eagles): Ruptured Achilles, missed final 9 games, plus the playoffs. • 2018 (Eagles): Calf injury, missed four games. Because of his durability concerns, as well as production that has has fallen off considerably over the last two seasons, Hicks' market value unquestionably has taken a hit. However, I still believe Hicks is a good player, particularly in coverage, which is what most teams are looking for these days in a league so heavily dominated by the passing game. I believe the Eagles will try to bring him back on a one-year deal, as long as some other team out there doesn't make a big bet on what Hicks was his first season and a half in the league. Like Darby and Tate above, Hicks is surprisingly one of the top three players available at his position, and yep, once again, might be overpaid by some team in free agency. #JimmyGuess: 1 year, $7 million. Will count toward the comp pick formula at the fifth-round pick level, if that's with another team. Ajayi has well-publicized, chronic knee issues, and now an ACL tear on top of it. In his 11 regular season games and four playoff games (almost the equivalent of a full regular season) with the Birds, Ajayi was a nice contributor, totaling 157 carries for 776 yards (4.9 YPC) and four TDs. If indeed a market does not develop for Ajayi, I can see the Eagles having interest in bringing him back on a modest one-year, non-guaranteed deal, but certainly, he would have to prove that his ACL surgery isn't the straw that broke the camel's back. The running back class in free agency is a rare bright spot, so I think Ajayi will have to sign a one-year prove it deal this offseason. #JimmyGuess: 1 year, $3 million. Will count toward the comp pick formula at the seventh-round pick level, if that's with another team. • QB Nate Sudfeld: Sudfeld will be a restricted free agent this offseason. The Eagles will obviously place a tender on him. It's just a matter of at what level. They have three choices: They can tender him at the first-round level, the second-round level, or at the level of his original draft position (or low tender). If another team were to sign Sudfeld to an offer sheet, the Eagles would have a chance to match that offer, or allow him to sign with the other team, gaining a draft pick in the corresponding round with which they tendered him. The higher the draft round the Eagles tender him at, the higher the cost his 2019 contract will be if he doesn't get any offers elsewhere. Since Sudfeld was originally drafted in the sixth round, if the Eagles tendered him at the "original round" level, a team could sign Sudfeld to an offer sheet, and the Eagles would only get a sixth-round pick in return if they couldn't match it. Sudfeld is worth far more than a sixth-round pick, so the Eagles absolutely do not want to see him get a nice offer from some other team, which would cost them either a lot of money to match, or only net them a sixth-round pick for losing their soon-to-be No. 2 quarterback. The bet here is that the Eagles tender Sudfeld at the second-round level, as they would happily take a second-round pick in return for losing him, and no other team is likely to want him that badly. The difference of roughly $1.1 million between the original round tender and the second-round tender is insurance worth paying, in my opinion. To note, locking Sudfeld up beyond 2019 by signing him to a multi-year deal also makes some sense. • K Jake Elliott and LS Rick Lovato: Both Elliott and Lovato are exclusive rights free agents. The Eagles can tender them for peanuts, which they certainly will.